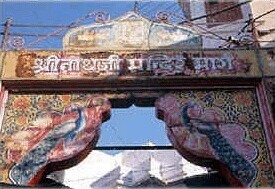 Nathdwara, one of the Nava Dwarakas, is a small town in Mavli-Udiapur route. As part of Sri Krishna anubhava yatra, after darshan of the Lord at Mathura, Vrindavan and Goverdhan, we proceeded to have darshan of Nava Dwarakas scattered over in Gujarat, Saurashtra and Rajasthan. WE had taken a train from Mathura to Udaipur to visit Nathdwara. The co-passengers however advised us to get down at Mauvli as it is nearer to Nathdwara. A 40 minutes drive took us to Nathdwara from Mauvli . We refreshed ourselves in a nearby rest house Lakshmi Lodge, one of the hotels opposite car parking(a big open ground) on the way to temple. For one hour, we paid nominal amount of Rs.100/- for the same. It was 10 A.M. by the time we finished and proceeded to the temple . A five minute walk along the narrow streets led to the temple. This reminded us of Pandirpur Divya Kshetram in Maharashtra . Here LORD gives darshan with HIS left hand raised upwards with little finger pointing upwards, HIS right hand closed in a fist rests on HIS hip. HIS eyes glance downward affectionately at HIS devotees. 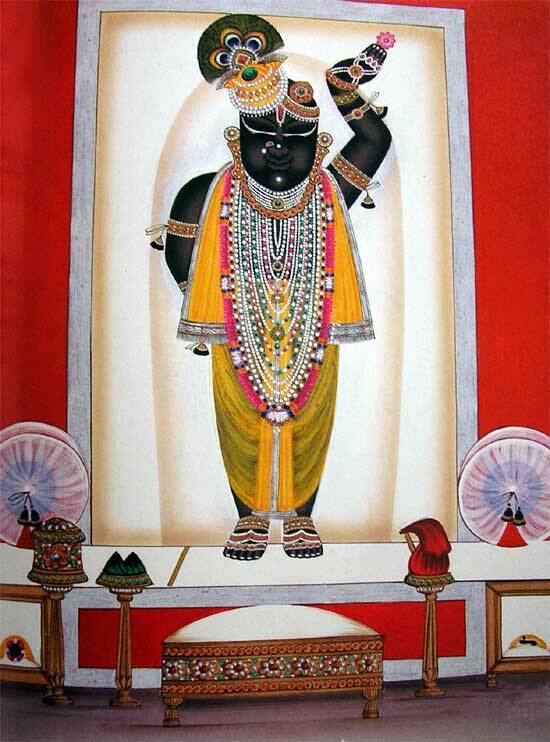 Lord Shrinathji is very special and attractive diety. There is a diamond stone on the chin of the Lord. This deity is swayambhu (self manifested and not carved by anyone). As the Lord is the combined form of Radharani and Gopala, HE is known as “SHRI SHRINATHJI”. ( “SHRI” indicates Thayar ). The Lord is also affectionately called as “Banke Bhihari”. The LORD was earlier in Vrindavan near Goverdhana giri and is related to one of Sri Krishna’s pastimes in Vrindavan lifting Goverdhana hill. To briefly recapitulate, Nanda Maharaja after consulting the other elderly gopas, decided to do pooja and give offerings to Indra, the king of devas , as they thought that Indra was responsible for timely rains and good yield of their crops. When the discussion was thus going on, child Sri Krishna , who was only 7 years old , intervened saying that Indra was not responsible for the cattle prosperity and it was Goverdhana giri which was responsible for the same as it provides the necessary grass to cattle, and crops to the gopas. Krishna suggested that they should therefore give their offerings to Goverdhana giri and all the gopas including Nanda Maharaj accepted to this proposal. An auspicious day was selected and all the gopas assembled in front of Goverdhana giri with heaps of offerings. Krishna advised them to close their eyes and everyone obeyed. Then Krishna assumed a huge form and with wide opened mouth, He consumed the entire offering without leaving anything for others. (Our poorvacharyars point out that Lord Krishna consumed the entire offering which was given to Goverdhana giri because HE didn’t want HIS devotees to partake the offering made to demi gods. We are supposed to consume only what is offered to Lord Krishna). When it was finished, Krishna resumed HIS original child form and joined the gopis. The gopis were pleased to see that their offerings were accepted and happily returned home. Indra was naturally upset that no offering was made and decided to punish the gopis by sending torrential rains accompanied by thunder storms. Not knowing what to do, all the vraj vasis( gopis) approached Sri Krishna for help with their cattle and children. The child Krishna assured them and to their astonishment, lifted the Goverdhana giri with HIS left hand little finger and all the residents of Vrindavan along with their cattle took shelter under the hill . ” KUNDRAM ENDHI KULIR MAZHAI KAATHAVAN” . LORD Krishna thus stood braving for 7 days. Indra thus humbled realized HIS folly and surrendered at Lord Krishna’s Lotus feet for forgiveness. 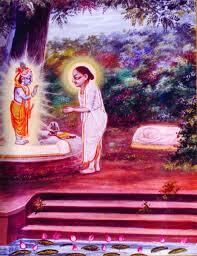 Repenting for not realizing who Krishna was, he prayed to Krishna for forgiveness which is known as Govinda Stuthi. 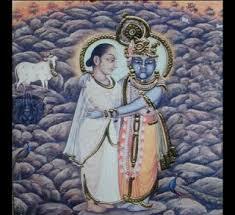 Krishna came to be known as “GOVINDA”- the protector of cows. Indra did Govinda pattabhishekam to Krishna with Kamadhenu , the divine cow and left the place. The devotees of Lord Krishna recite this Govinda stuti while offering abhishekam to the Lord. To mark this incident, King Vajranabha constructed a temple at the foot of the hill. Due to passage of time, this deity disappeared and the whereabouts remained unknown for many years. After many years, LORD appeared as Gopala in Madhavendra Puri’s dream, informed him about HIS whereabouts and subsequently, a temple was constructed in Goverdhanagiri . When Aurangzeb invaded Mathura and Vrindavan, the deity disappeared into the hill and could not be traced out. One night, the all compassionate Lord appeared in Vallabhacharyar’s dream who was a great devotee and ordered him to take HIM away from Goverdhan to Mewar. When Sri Vallabacharyar reached Goverdhanagiri, the idol emerged out by itself . (This reminds me the of the incident connected to Melkote Selva Narayana Perumal. Melkote is a small village near Mysore on the banks of Kalyani Pushkarini . When Swamy Ramanujar arrived here, there was no temple. The Lord of the Universe chose to be hidden under sand dunes awaiting Swamy Ramanujar’s arrival. Perumal appeared in his dream and informed HIS whereabouts . With the help of the local king and devotees, Swamy Ramanujar dug the place and traced out Perumal. The pathway to the hill which was filled with bushes and thorns were cleared and a temple was constructed in which the moolavar Thirunarayanan was placed in the sanctum sanctorum according to vedic rituals. As there was no utsavar, Udayavar prayed to Perumal for disclosing HIS whereabouts . The utsava murthi appeared in Sri Ramanujar’s dream informing that HE was presently with Sultan of Delhi. At the ripe age , Swamy Ramanujar undertook the journey to Delhi and requested the king to return the idol. As there were many such idols which the king brought by looting various temples, he asked our acharyar to locate the idol. Ramanujar was taken to a storeroom where many idols were heaped. But as none matched with his divine vision of the Lord, acharyar was disheartened. Vallabacharyar arranged a cart for Perumal and left for Mewar. Rana Raja Singh of Mewar helped Vallabhacharyar . After 2 months, the cart reached the present Nathdwara enroute to Mewar in the 17th century. But on the way to Mewar, the cart stopped suddenly at this place and did not move an inch. Vallabacharyar heard a divine voice say that Perumal wished to stay in this place itself as it was the place where HIS dear devotee, Meera bhai stayed. ( The story of Meera bhai is well known to all of us. To briefly recapitulate, Mira bhai was fondly attached to Krishna’s idol given by her father. As a child, she always used to play with the , dress Him up and sing songs in praise of the and considered Krishna to be her spouse. She exhibited bhakti like the gopis of Vrindavan. The king of Mewar impressed with her bhakti married her despite having many queens. Though she was the queen of Mewar, she was totally disinterested in material comforts and always used to be in service of the Lord. In fact with every passing day, her bhakti enhanced and she was totally immersed in Krishna Bhakti. She was unmindful of all the hardships and tortures implicated on her by the annoyed king and her co-sisters. They tried to kill her in many ways by even giving her poisoned milk. Mira offered the milk to her Lord and drank it. Swamy Vallabhacharyar with the help of Mewar king constructed a beautiful temple for the Lord . Vallabhacharyar used to please the Lord with his kirtans which was later followed by his disciples. Situated in the heart of the town, SHRINATHJI temple is the main attraction with thousands of devotees thronging to the temple daily. This is the second richest temple in India, first being Tirumala temple. Opposite to the temple is the information centre who guide the pilgrims for prashad, timings etc. Near the entrance of the temple, we can find many vendors selling varieties of vegetables and fruits. . There is a unique practice followed in this temple. Usually we find vendors selling coconuts,tulasi and flowers in front of the temple. But here vendors sell varieties of fruits,vegetables,milk etc which would be used for Lords (Perumal’s) bhog (neivedyam-food offering). Devotees can offer milk, varieties of fruits,vegetables which would be used for Perumal’s bhog (neivedyam-food offering). Milk is to be given at a different place and vegetables , fruits in another place. It is customary for the local devotees to pray to the Lord for fulfilling their wish and when it gets fulfilled, people offer to change the flag on the Gopuram ( Temple top ) . The temple has 5 kainkaryapaars( serve the Lord) who are authorized to change the flag which is a hereditary right for them. While the flag is being changed, the assembled devotees continuously sing in praise of the Lord . As we were waiting near the entrance, an elderly person came forward and offered to guide us . He gave us information about the temple which we could not get any where . He took us to the first floor of the temple where kirtan was going on while the temple flag was being changed. He informed that it was customary for the local devotees to pray to the Lord for fulfilling their wish and when it was fulfilled, people offer to change the flag. The temple has 5 persons who are authorized to change the flag. This is hereditary right for them. While the flag is being changed, the assembled devotees continuously sing in praise of the Lord . 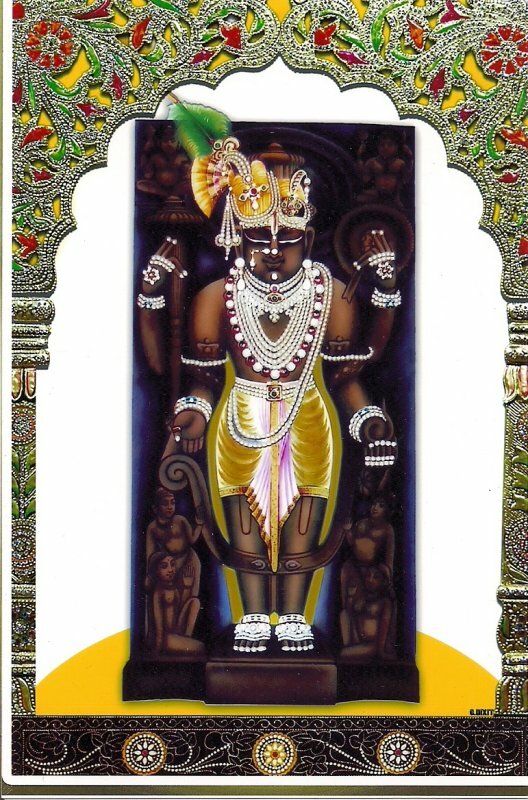 He then took us to a room where a big photograph of Perumal “SHRI SHRINATHJI” was hung and pointed out to the nose ring worn by Perumal and a diamond stone studded on Perumal’s chin. It was for taking this diamond that Aurangzeb invaded Mathura but HIS attempts became futile because disappeared from that place. He said that in the garbagriham, Perumal gives darshan as Krishna-Radha rani together and hence is known as “SHRI SHRINATHJI”. 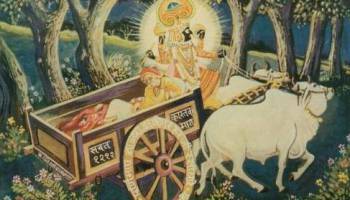 The pandit ushered us to a room where the cart in which the Lord arrived is kept. This event is commemorated every year. A new cart is made and is rested on the cart. In the adjacent room, there are 2 mortars- one made of gold and the other made of silver. Once in eight days, chandan(sandal paste ) for the LORD is ground using these mortars. In east of the temple, the photographs of Sri Vallabhacharyar along with his descendants are displayed. Bhog is offered to Perumal on behalf of Sri Vallabhacharyar. We offered our obeisances and reached the entrance of the main sannidhi. In front of the sannidhi, the guide showed us a place where sets of 5 coconuts were tied to a string and hung. 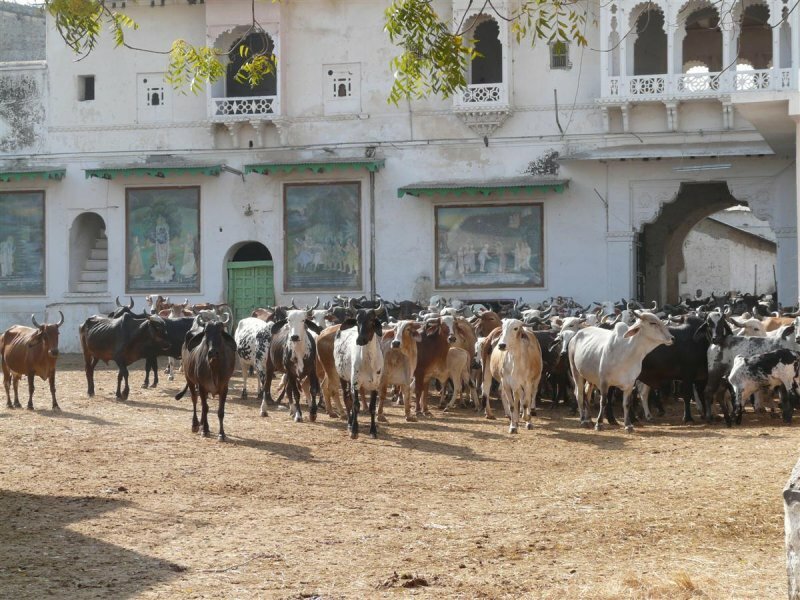 It was a typical Gokulam scene –serene atmosphere with vendors doing their business as god’s seva without any competition and cows moving around freely inside and outside the temple. Like in Puri dhaam , the pandas have hereditary right for their share in temple prashad daily and they in turn sell it to the devotees . Another similarity is like in Jagannath Puri, here many varieties of food are offered to the Lord..
To have the next darshan at 11.30 A.M. , devotees had already gathered in large numbers in front of the big closed doors. WE handed over the 11 varieties of fruits and 11 varieties of vegetables and 2 pots of milk which we had purchased earlier at the respective kitchens ( we wished we could have bought some rice , cereals, sugar , jaggery, dry fruits for the offering.) and started reciting Sri Vishnu Sahasranamam while waiting outside. When we completed , the doors sprang open and the devotees thronged inside to have darshan of the LORD . There is a separate queue for ladies and gents. It is a common practice in North India to have darshan of the Lord when the doors are opened and aarthi is given . Hence the hall in front of the sannidhi is constructed in such a way so as to accommodate few hundreds of devotees at a time. All the devotees can have darshan of the Lord during haarthi and the devotees themselves can offer prasadam- sweets/dry fruits to the Lord. As they consider the “Lord of Universe” as a small “child”- the Lord is “NANDHA LAALA”- the darling of Nanda maharaja, the darshan is allowed only for fifteen minutes because the child has to take rest. Again after an hour, the altar is opened for darshan. EVerytime, neivedyam is offered to the Lord. AFter darshan, the devotees who are immersed in the beautiful form of the Lord leave the place half-heartedly continuously gazing at the divya mangala swaroopam of the most enchanting CHILD of the Universe until they are gently ushered out. The LORD is dressed like a small cowherd boy of 7 years . The haarthi had just begun and shodasa upacharams (16 types of upacharam) were offered to the Lord while chanting slokas and singing songs. Lord was dressed in “Parrot green coloured “cloth round HIS waist like a typical cowherd boy and was adorned with varieties of flowers. Adiyen recollected Periazwar’s pasurams describing the Lord’s return to HIS home after gazing the cows. Amidst loudly uttering “KANNAIYA LAL KI JAI” and singing of haarthi songs, we could experience the unalloyed vatsalya bhaavam of the devotees present. Like the gopis of Vrindavan , the devotees were unaware of their surroundings with their whole concentration on the LORD alone. The LORD is very very attractive with HIS left hand raised up with HIS little finger lifted up and HIS right hand closed in a fist and placed on HIS waist. A small stick is placed in front of Him which is used while gazing cows. We were being squeezed out in the rush but were unmindful of the pushing . The devotees were competing with each other to have a very close darshan. Fortunately, we had darshan to our heart’s content. We just couldn’t take our eyes off from the Lords Thirumeni. Every part is so attractive that we felt that one darshan is not enough. A person standing on a higher platform in the hall was touching the devotees head with a stick which is considered to be a blessing. NOT THE DARSHAN WHAT WE SEEK,…………………………. IT IS THE DARSHAN WHAT HE GIVES”. After darshan, we had to come out through another door in front of which there is a small sannidhi where charanamruth (theertham/ holy water) is distributed. Beside this, there is a counter from which the devotees can purchase sweets, laddus etc by paying money. This counter also would be open only for limited time. As instructed by the panda who offered us prashad, we were sitting in front of the main door recollecting Perumal’s divya mangala swaroopam. After some time, my wife went in search of the Panda, and brought the prashad in two plates which was carried by panda’s attendant.. As having prashad in the temple premises is strictly prohibited, the attendant showed us a dharmashaala where we could have the prashad. Like in Jagannath Puri, many varieties of prasadam are offered to the Lord and are distributed to all the pandas. So it is better to purchase prasadam through two or three pandas because we would be able to partake the various prasadams. Excellent .No words to express. U showed the temple in front of us. Reading this motivates me to visit this place atleast once in my life time .Hare Krishna. Jai shree krishna. 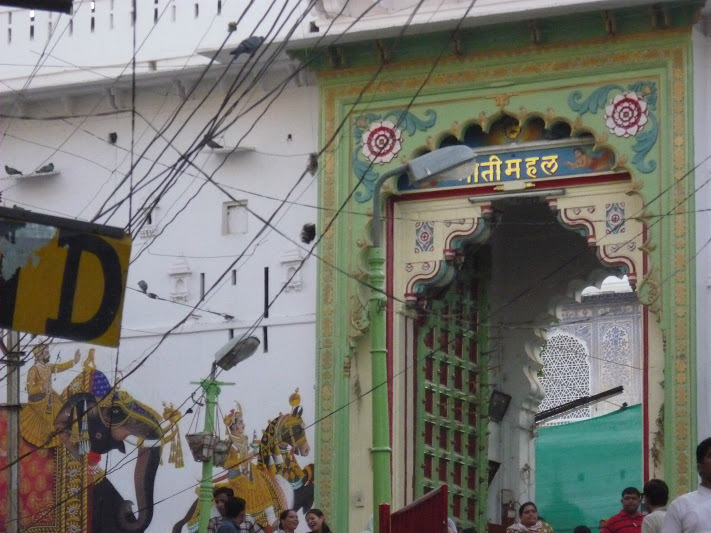 Nathdwara, one of the Nava Dwarakas, is a small town in Mavli-Udiapur route.As the Lord is the combined form of Radharani and Gopala, HE is known as “SHRI SHRINATHJI”. ( “SHRI” indicates Thayar ). The Lord is also affectionately called as “Banke Bhihari”. The LORD was earlier in Vrindavan near Goverdhana giri and is related to one of Sri Krishna’s pastimes in Vrindavan lifting Goverdhana hill…. It is such a genuine and heart felt narration that I’ve book marked this and have read this article many times! It inspires other vaishnavas to yearn for THE ONE. As they say, it is NOT THE DARSHAN WHAT WE SEEK, IT IS THE DARSHAN WHAT HE GIVES”. Great observation! Our eyes are so fragile that without light it cannot see anything and it is just by Lord’s mercy we can see anything. Hari Om! 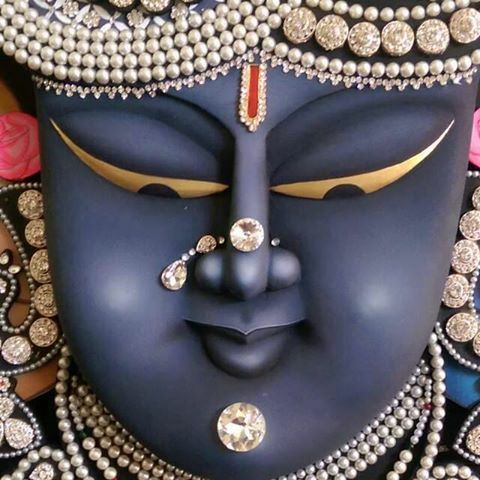 For few mins I was far away from this world , mind totally absorbed with ShriNathji! What a Blessing all by the true efforts of our Varadan. Incidents of Lord escaping from invaders only intensify our Faith. Highly Informative. My Gratitude is at Infinity to Varadan.